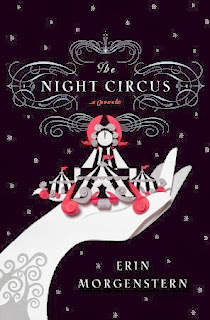 This month we read the beautiful and mysterious book The Night Circus by Erin Morgenstern. Overall it was enjoyed, but we felt it was not without some issues. Overall we found the book to be intriguing, though some expected it to get boring. But the descriptions were all so fun and fabulous, and the characters full of life, that it made for a fun, fanciful romantic gothic read. On the downside, some felt it was too jumpy in the beginning, and didn't have enough conflict to be compelling. The writing reflected that of a first author who has room for improvement. A particular peeve was using some words way too often, such as "elegant" which was used to the point of exhaustion. But overall a fun page turner. Madeline provided us with ambiance that matched the book! Marco returning to his original face. The people who woke to reality and then fell asleep again. Dare in the tree...return to childhood. What made us drool? Puff pastries. Oysters. Chocolate mice. Hot chocolate. Unfortunately, we didn't make any of those food items, but did have a wondrous feast anyways. Next month we will be reading Patricia Reilly Giff's Gingersnap, a kids' historical fiction. There will be lots of soup, and of course gingersnaps! We will be meeting at 6:30 on Wednesday November 13, 2013.